One of the key attractions at Lumpini Park is the “Golden Jubilee Swiss Stone Fountain”, which was inaugurated in September 1996 to commemorate the 50th Anniversary of the Ascension to the Throne of the late King H.M. Bhumibol Adulyadej. 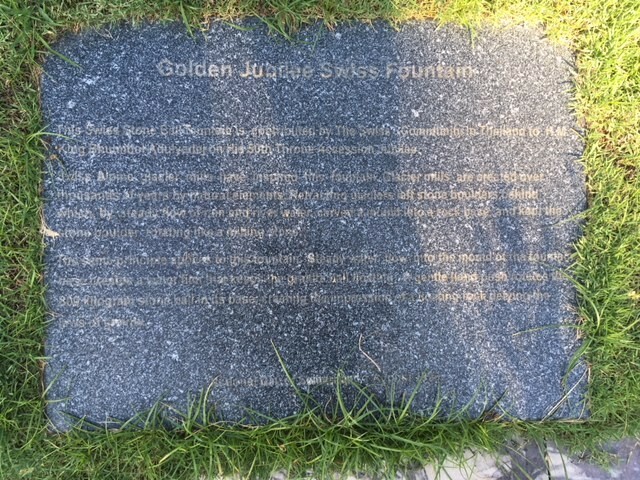 The fountain, composed of Swiss granite stone which turns perpetually as long as there is a source of water, was designed by Swiss compatriot Kurt Leutwiler. It was commissioned by H.R.H. the late Princess Galyani Vadhana, who had a close affiliation to Switzerland. Under the tutelage of the Swiss Thai Chamber of Commerce and Swiss Embassy, a number of Swiss companies sponsored the construction of the fountain as a display of the long-lasting and warm friendship between the Royal Thai government and the Swiss Confederation. For those of our members who participated at the inauguration in 1996, it was a truly memorable event, especially the evening celebration at the Grand Hyatt Hotel, which was attended by several hundreds of members and guests, including the late Prime Minister General Chatchai Choonavan and his wife Thanpuying Boonruen. As the maintenance was neglected over the years for a number of reasons, the granite stone is not spinning anymore and the fountain finds itself in a rather desolate state. As part of the STCC 20th anniversary celebrations, the STCC decided to bring this historical monument back to its old glory days and assume the responsibility to undertake all necessary renovation work, under the guidance of the governmental authorities of the City of Bangkok. It is one of our key projects as part of our 20th anniversary celebrations and displays the respect all of the STCC members have for his Majesty the King, the Royal Family, the Royal Thai Government institutions and last but not last to the Thai people.